The gastrointestinal tract works like a well-functioning "clockwork". All functions of the gastrointestinal tract are performed exactly according to the schedule. Stomach ulcer, gastritis recede. It is recommended to use as for cosmetic purposes: in the form of nourishing masks, anti-cellulite wrapping. Contains a full set of natural amino acids, algal cellulose (salts of alginic acid), minerals, macro and microelements, a wide range of vitamins, organic iodine. All elements are present in optimal proportions in the form of organic substances, which are easily absorbed by the body. Cucumaria is the source of: glucosamine, collagen, triterpene glycosides, amino acids, phospho- and glycolipids, chondroitin sulfate, B vitamins, trace elements: calcium, magnesium, potassium, manganese, iodine, cobalt, zinc, copper and selenium. Sea urchin caviar contains a unique complex of biologically active substances: Omega 3, phospholipids (lecithin predominates), carotenoids, fat-soluble vitamins (A, E); vitamins: C, B1, B2, B12, PP, K1, etc., macro- and microelements (iodine, iron, copper, etc.) in easily digestible form, essential amino acids, nucleic acids. provide food for the entire human nervous system. The corcicle contains a full complex of natural free amino acids, including two essential amino acids, citrulline and ornithine. L-Citrulin is an indispensable amino acid that is not contained in the food protein. This is the precursor of the formation of L - arginine. Ornithine in the body is synthesized from arginine and, in turn, serves as a precursor for citrulline, proline, glutamic acid. contribute to the production of insulin;support the function of the immune system. Scallop is a source of free amino acids, low molecular weight proteins and peptides, which improve vision, stimulate the brain, strengthen the heart muscle, stabilize the heart rhythm, regulate the sugar content in the blood. Method of preparation from powder: 6 g. Powder diluted with warm boiled water 100-130 ml, mix thoroughly, hold until complete recovery 30-40 minutes. Eat 1 tablespoon 1-3 times a day for 30 minutes before meals. Daily intake for 15-30 days improves the function of the gastrointestinal tract. Laminaria extract nutritional product (dried) is recommended for cosmetic purposes: in the form of nourishing masks, anti-cellulite wrapping. Thanks to a complex of biologically active substances, intensive nourishment of the skin is provided, skin restoration processes are accelerated. Method of application: apply a small amount of cocktail for 20-30 minutes on the skin. After washing off the mask with warm water. It is recommended to apply once a week. 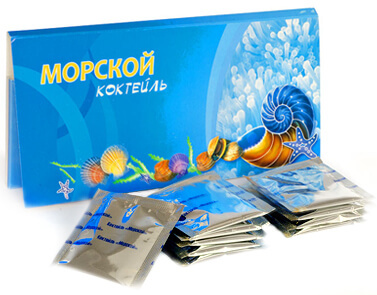 Store Laminaria extract nutritional product (dried) at ambient temperature and air humidity of 80%. Shelf life: 12 months. Contraindications: individual sensitivity to the product and conditions in which iodine is contraindicated.